If a golfer is only as good as their tools, it makes sense that you need a tool to track and measure your results. However, you’ll need more than just the numbers that make it to the scorecard. You’ll want the reasons why the golf ball is reacting the way it does from your swing. You’ll want data such as carry distance, club head speed, ball speed, smash, vertical launch angle, spin, height and flight time. Originally founded in 1989 to measure projectiles for the defense industry, FlightScope is a world leader in golf radars and launch monitors for sports. Their products are used by top golf instructors, club fitters and tour players around the world. The company provides applications for golf, tennis, baseball and cricket. Their radar-based launch monitors can analyze up to 41 different data parameters across these sports. 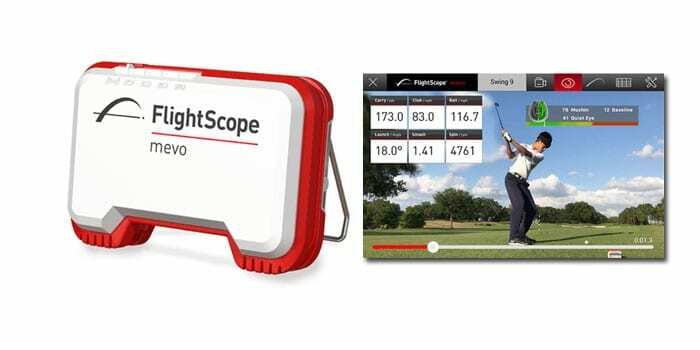 FlightScope created their first product prototype for golf over twenty years ago. Their radar launch monitors are now used by many of the top players such as Bryson DeChambeau on tours around the world. The FlightScope mevo was launched in 2017 and uses radar technology similar to the main FlightScope launch monitors to track the flight of the ball. Simply position the device behind your swing and sync it with the FlightScope mevo app that’s available from the App Store or Google Play. The FlightScope mevo is simple to set up and the accuracy of the data is outstanding. Since it’s light and smaller than your phone, the product is also easy to fit in your golf bag or even your pocket. Once the launch monitor is place, simply select the club that you will be using on the app and start swinging. You’ll hear a chime when the monitor is ready and you’ll see the results within a few seconds after impact. The app also provides a verbal announcements of your data, allowing you to completely focus on your swing. Save, upload and share practice sessions. Action video clips captured by phone with data overlay. Automatic video clipping and storage. According golf statistics guru Mark Broadie, knowing your distances can be essential, especially for shots 150 yards and in. This product allows you to see exactly how far each club carries so you know the right club to hit in virtually any situation. The FlightScope mevo also features integrated video in the app so you can record a swing and receive launch monitor statistics in sequence with the swing. This can be a great tool for a player or a coach to revisit an individual swing and its data to identify a possible fix. Unlike the main Flightscope launch monitors which can retail for $10,000 or more, the FlightScope mevo costs $500. That’s a tremendous value for a product that can provide some extremely valuable information to help improve your game. This is an awesome tool for any golfer, whether you’re a high handicapper or scratch player. The data that it provides can help you with every club selection on the course and help identify the exact reasons why the golf ball is behaving a certain way. However, the real power comes from integrating this feedback with the guidance of a PGA professional who can then identify what corrections you might need. It’s a powerful tool for your golf bag, made even stronger with the right advice.